On most of the PPG engines that employ a Walbro (especially WB 32) carburetor, many pilots encounter a very undesirable feature: rough low or mid-range RPM. This is a very inconvenient effect for the pilot especially while doing precision flying at low altitudes. In this RPM range the engine is running rich and it is not very responsive to small throttle changes. In certain situations while doing low altitude maneuvering, a rough and less responsive engine, may pose a certain risc to the pilot who already is in a very dangerous situation. Low altitude precision flying should be performed only by very experienced pilots and with engines running very predictable at low RPM's. Doing such type of flying, I encountered the very annoying and somewhat dangerous mid-RPM engine operation. Important note: Four cycling (rough mid range RPM) is not dangerous for the engine but it can make piloting very difficult. During normal flying, the pilot will usually avoid this effect by choosing a higher or very low throttle setting. However, doing precision low altitude flying, very often this rough mid-range operation can not be avoided. 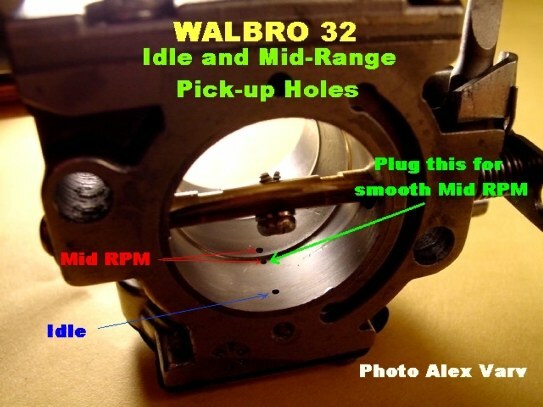 I have performed many tests with the Walbro 32 used on most PPG engines. Except leaner setting of the LO screw while using my in-flight carburetor mixture adjuster, I could not really find a way to eliminate the rough engine operation. finally understood that the rough mid-range operation is caused by a too rich setting. 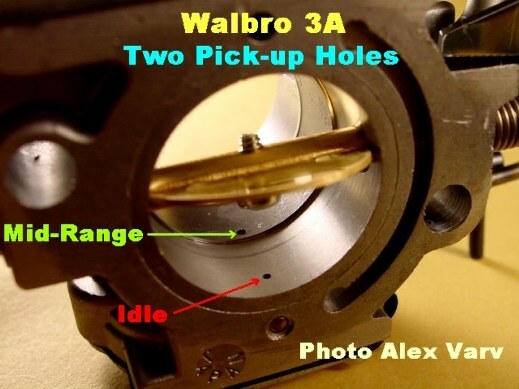 I found the Walbro 3A which instead of three primary pick-up holes (please refer to my previous material "Walbro and Tillotson Carburetors) the WB 3A has only two holes thus theoretically would run leaner in the mid range. This carburetor gave an excellent low and mid range RPM. However the Cors-Air engine never achieved its peak 7,350 RPM as it usually did with the Walbro 32. It turned out that the WB 3A has a narrower venturi, which means it is not a high RPM carburetor. I have not tried it with the Solo but I suspect that for 6,500 RPM peak, it would work. Next I went back to the Walbro 32 and I tried to lean the mid-range RPM. Based upon the WB 2A, I plugged the last pick-up hole and then I tried to plug the mid pick up hole. The Cors-Air M21Y performs flawlessly with the third hole plugged. A pilot from Hungary, Ferenc Galambos, experimented with the Walbro 32 on a Solo 21o and seems that plugging the middle hole works better.